Sensor: The Canon SX50 HS features 12.1MP CMOS image sensor, Panasonic FZ70 features 16.1 megapixel High Sensitivity BSI MOS sensor, In general back-illuminated sensor, BSI CMOS sensor gives better low-light performance when compared to normal CMOS sensor. 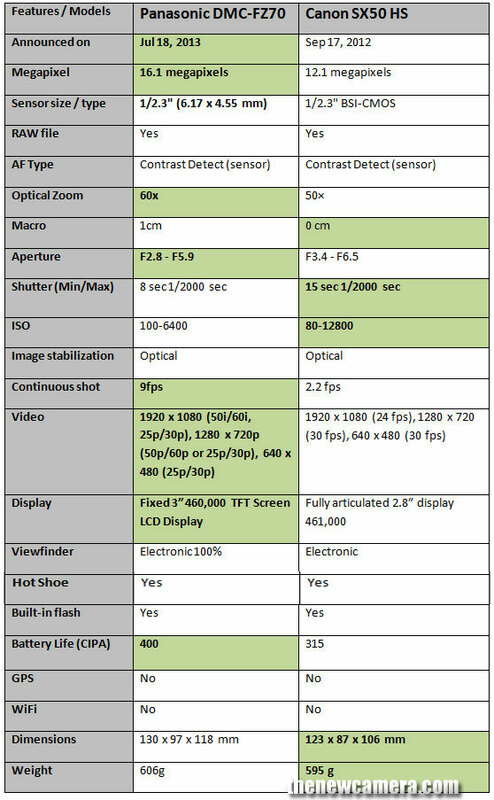 More ISO range in Canon: Canon offers more ISO range upto 80-12800, Panasonic FZ70 limited from 100-6400. Better Lens in FZ70: Panasonic FZ70 features 20% more wide coverage and 10X + optical zoom compared to Canon SX50HS, Due to the bright lens you get less noise in your images when compared to SX50 HS. Image Stabilization: The Canon SX50 HS features Hybrid Image stabilization, Intelligent IS to automatically select from six different modes to optimize image stabilization for the given situation: Normal, Panning, Macro (Hybrid) and Tripod IS for stills; and Dynamic, Powered, Macro and Tripod IS for video. Panasonic FZ70 comes with POWER O.I.S. (Optical Image Stabilizer), works on Still an d Video both. Continuous shooting Speed: The FZ70 can record up to 9 fps in a 3 shot burst, 5 fps with one-shot AF, or 2 fps with continuous AF. In Canon SX50 HS at Normal mode you get: approximately 2.2 shots/sec, High-Speed Burst HQ (6MP approx) enables continuous capture at 13fps for up to 10 frames. Video: Canon Capture high-definition 1920x1080p with stereo sound at 24fps and HD recording at 30 fps, Panasonic FZ70 features Full HD 1080i video recording at 60 fps is supported in the high quality AVCHD codec for fluid, well-detailed movies and 1080p video at 30 fps is also available in the Internet-friendly MP4 format. Display: Panasonic FZ70 incorporates a 3.0″ 460k-dot rear FIXED LCD monitor and a 0.20″ 202k-dot electronic viewfinder for live view monitoring, The Canon SX0 HS camera features a 2.8″ Vari-Angle LCD monitor with a resolution of 461,000 pixels and an electronic viewfinder with approximately 202,000 pixels. Verdict: If you are looking for a megazoom camera, we recommend you to buy Panasonic FZ70, you get 60X lens, BSI CMOS sensor, Fast Continuous shooting speed and Better Video mode. The Panasonic FZ70 price is $399, Available at Amazon and B&H store. DMC-FZ70 does have hot shoe, the picture has it. Thanks Mocky, the error is now corrected. FZ70 also has optional adapter that can add another telephoto lens to increase it to 100x optical zoom. I purchased the Panny FZ70 online with a 30 day return policy. Tried numerous settings and lighting combinations but the resulting images inevitably contained significant noise. Returned the camera and purchased the SX50 – photos have been outstanding with the Canon. So happy I switched. FZ70 shoots 9fps in a 3-shot burst, which is really 3 shots in .3 seconds, so technically that translates to 9fps. In order to truly shoot 9 frames in 1 second, you’d have to lower the resolution to 3MP. You can also purchase a 58mm threaded telephoto converter for the Canon SX50 as well.